Shared office space providers are gobbling up space in Manhattan at an unprecedented scale. The Real Deal took a look at five of the biggest players in this emerging business, analyzing their business models, their overall footprint and the rents they pay. 1) Regus- Total NYC space: More than 1.6 million square feet Regus CEO Mark Dixon and 104 West 40th Street Headquartered in Luxembourg, Regus has over 1,500 worldwide locations, and is rapidly expanding in Manhattan neighborhoods such as Soho, Lower Manhattan and Midtown. In July 2013, the company took nearly 30,000 square feet at David Tawfik’s 104 West 40th Street. In May 2013, it inked a 32,000-square-foot deal at Edward Minskoff’s 101 Sixth Avenue. It also took 40,000 square feet at Brookfield Office Properties’ Brookfield Place in February 2013. The average size of a lease inked by Regus is about 31,000 square feet, and the company pays an average rent in the low-$50s per square foot, according to CompStak data (Note: the average rent and lease sizes are weighted averages of only those deals represented in CompStak’s database — they do not include all of Regus’ deals) Regus is trying different tactics to get brokers comfortable with its business model. In July 2013, the company signed a deal with residential brokerage Oxford Property Group that allows Oxford agents access to its 38 business centers in Manhattan and allows them use of Regus’ business lounges and cafes, exclusive discounts on business-related products, meeting rooms, day offices and video communications. Regus does its deals through its national accounts group, said Mark Ravesloot, a vice-chairman at CBRE who is one of six brokers at the firm that work on Regus’ account in the city. The national accounts group reaches out to local brokers in each major market. Moving forward, Regus is eyeing spaces in the outer boroughs, he added, saying that their scale gave them a distinct advantage in the market. 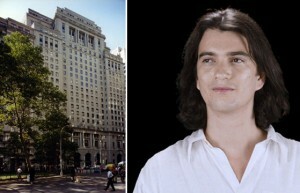 “They understand how to do their due diligence very quickly, from a construction standpoint and from a layout standpoint.” 2) WeWork – Total NYC space: More than 650,000 square feet (estimated) Adam Neumann and 25 Broadway Founded in 2010, WeWork is currently the most aggressive player in the shared office market, sources said. In January, the company signed a deal to take 115,000 square feet at 113-133 West 18th Street. The same month the firm also took 63,300 square feet at Himmel + Meringoff Properties’ 401 Park Avenue South. And in September, it inked an 86,000-square-foot lease at the Cunard Lines Building at 25 Broadway, as TRD reported. The company is also in talks to take half a million square feet at the Brooklyn Navy Yard and is close to snagging all 300,000 square feet at Rudin Management’s 110 Wall Street, according to previous news reports. WeWork is “very bullish on Lower Manhattan as well as other neighborhoods that serve as centers for innovative and creative companies,” Ben Kessler, the company’s director of marketing, said in a statement. Kessler wouldn’t comment on the company’s total square footage in New York City and declined to elaborate on how WeWork’s relationships with landlords had changed over time. WeWork’s average transaction size is close to 69,000 square feet, according to CompStak data, and it pays an average rent in the low-$40s per square foot. As of January 2013, the New York-based WeWork had raised over $20 million from private investors, including Joel Schreiber, owner of Manhattan real estate investment firm Waterbridge Capital. 3. Corporate Suites- Total NYC space: More than 230,000 square feet (estimated) Corporate Suites’ seven locations include 641 Lexington Avenue near Grand Central and 22 Cortlandt Street in the Financial District. 4. Virgo Business Centers- Total NYC space: 180,000 square feet Arnold Fisher and 1345 Avenue of the Americas In November, Virgo took 40,791 square feet at Fisher Brothers’ 1345 Avenue of the Americas, as TRD reported. The deal was Virgo’s sixth in Manhattan since its inception in 1998 and its first on the West Side. The company also occupies a 20,000-square-foot space in the Empire State Building and a 40,000-square-foot space at 575 Lexington Avenue. “The growth has obviously been big,” Virgo CEO Sarah Klein said of the shared-office sector in November. “Otherwise we would not have been expanding.” 5. Jay Suites- Total NYC space: Over 150,000 square feet In November, Jay Suites, founded in 2009 by brothers Juda and Jack Srour – both were fresh out of high school at the time — took a nearly 28,000-square-foot space at 31 West 34th Street, as TRD reported. The deal brought the company’s total Manhattan footprint to north of 150,000 square feet. Its other locations include 1441 Broadway, 369 Lexington Avenue, and 30 Broad Street. Jay Suites is in talks to acquire further spaces of between 20,000 and 30,000 square feet in the Columbus Circle and Union Square markets, Juda Srour told TRD. The company and is also mulling developing its own shared-office-space building on Downtown Brooklyn’s Willoughby Street. Each neighborhood has its characteristic tenants, Srour added. “Downtown you get traders. Midtown East is the finance guys and the lawyers. And in Midtown South and Times Square, you have the tech companies.” Jay Suites aims to compete on price, Srour said, and can undercut the competition by up to 30 percent because the company uses its own contractors to build out a space. He was very direct about how the company went about choosing its locations. “We really look at where Regus is located, and we try to open next door,” he said, adding that he estimated up to 40 percent of its clients were poached from the Luxembourg-based giant.